CADFA in the streets on the first anniversary of the savage attacks on Gaza that left over two thousand dead including over 500 children. Untold numbers disabled, wounded, orphaned, made homeless, traumatised, and the savage siege on Gaza still continues. 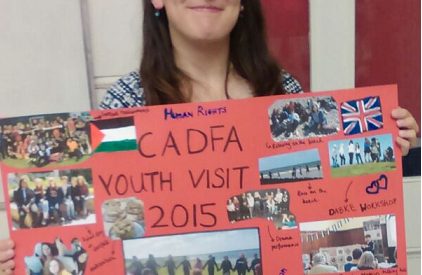 CADFA’s June 2015 youth visit brought 15 Palestinians with their UK friends to Norfolk , Norwich, Cambridge and London. So much happened on the visit -outings, school visits, drama workshops, child prisoner marches, public events and fun. Find out more about it from the blog and get in touch with us to take part in future youth links with Palestine. This was part of the Erasmus + ‘Twinning in Action’ project.